For those of you that attended our Users Conference we talked about some exciting enhancements to the GoCanvas product in 2019. This particular release will gives us a good segue into one of the more exciting changes coming to GoCanvas. We are really doubling down on improving the usability or "user experience" of our product. You will see some incredible changes to the App Builder with this release. But we are just getting started. In recent months we have hired a number of new team members that will help us. We hired a User Experience Researcher that focuses exclusively on getting feedback from GoCanvas users and non-GoCanvas users about potential changes to how our product works. Virtually everything that we change on our website will be tested extensively first. Our designers will then re-work their designs and they will be tested again. Her name is Stephanie Pratt and some of you have worked with her already or met her at Transform 2018 back in October. If you hear from Stephanie or see a survey pop-up on our website then your chance to influence our product has arrived. Please take advantage of it! We have also hired a Sr. Director of User Experience. She is 100% focused on User Experience. Her name is Emily Ryan. The only thing she cares about is YOU and your ability to discover and use GoCanvas. The designers on our team work for her and they will be working diligently to make GoCanvas more usable. In fact, there is a room at our office now with a print out of every single page on our website. EVERYTHING is being scrutinized by Emily and her team. Her team consists of team members that have been with GoCanvas for years and years, too. So there is a good mix of fresh eyes and an understanding of our customers. We are also going to be exploring other areas where we can help you with the challenges you face in operating your business. Whether those are internal operational challenges or challenges in working with your customers, we want our platform to assist you in DOING MORE. One of those challenges we are actively working on is your ability to analyze the data you collect with GoCanvas. You may not be ready to do this today, but down the road our hope has always been that you will learn things about your business that you were previously not able to when collecting data on paper. We will be launching GoCanvas Analytics this year. It will allow you to create reports and visualize your data via dashboards that will allow you to make better (and much faster!) decisions. It will give you insights into your business that will allow you to grow and expand. If you are interested in learning more about GoCanvas Analytics and want to be kept up to date on our progress, please click below to sign-up for email updates. And when we are ready to put this in the hands of customers you'll be the first people we reach out to. Now let's get to the new stuff! We think you'll really like the new look and some of the changes we made. Overall, we obviously made a lot of changes to how things look. Some are subtle so I won't point them all out. Fields - We put the fields into groupings to make them easier to find. App Name - You can now name your app on the device in the workspace. I, for one, always have clicked on that to edit or name my App! This will save me clicks for sure! 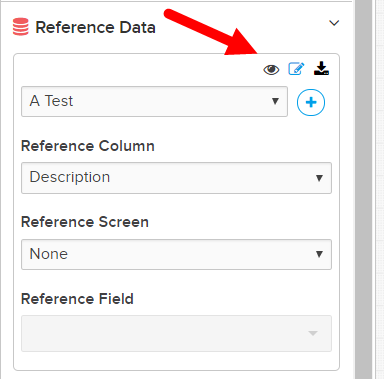 We also made changes to how our Reference Data controls looks inside the App Builder. It is a slight change but we think it is a lot cleaner now. We also made more changes to the flow when you publish a GoCanvas App. You will assign to Groups and Users on separate screens now. And at the end you will get this screen below giving you options to navigate to wherever you want to go after publishing. 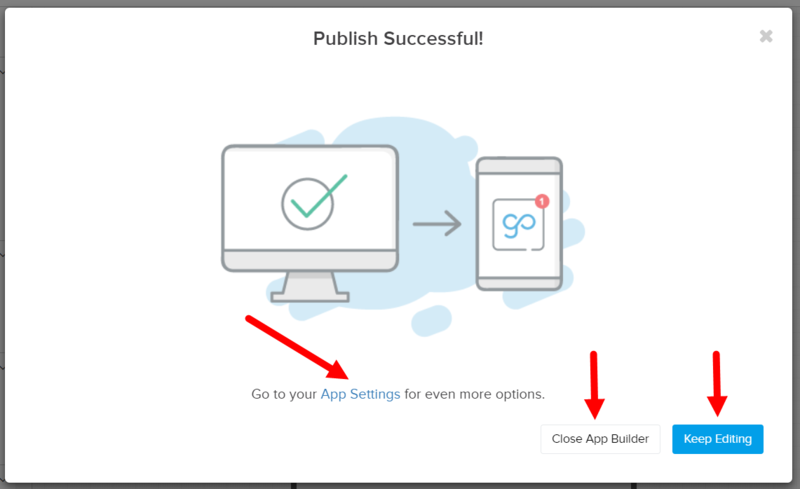 You can navigate directly to your App Settings, close the App Builder or keep editing your App. We also changed the language for our PDF Visible and Web Visible settings. These are really powerful settings but we felt like they were not named in a way that would make sense to most folks. We have added PAGE NUMBERING! I know...I know... I can hardly control my excitement, too. You can enable it by going to the Global Settings area. 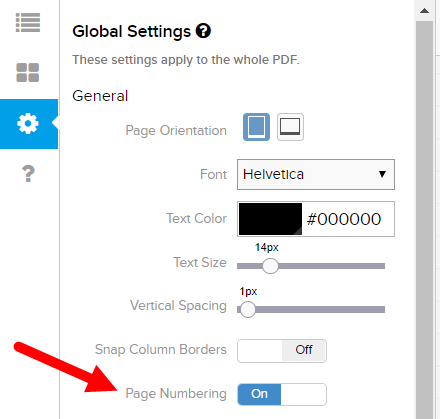 The page number will appear in the lower right hand corner of your PDF.